And then there is track eight of each one -- "Stray Cat Blues" from Beggar's Banquet and "Monkey Man" from Let It Bleed. Both have Jagger out of control as he really gets into both songs, howling the lines in both and screaming about being a monkey in one. He also tended to let loose during "Love in Vain" live (see Leeds University boot from '71!) but keeps it cool. Let It Bleed is the eighth album by English rock band The Rolling Stones, released in December 1969 by Decca Records in the United Kingdom and London Records in the United States. Released shortly after the band's 1969 American Tour, it is the follow up to 1968's Beggars Banquet and the last album by the band to feature Brian Jones. Although they had begun the recording of "You Can't Always Get What You Want" in May 1968, before Beggars Banquet had been released, recording for Let It Bleed began in earnest in February 1969 and would continue sporadically until November. Brian Jones performs on only two tracks, playing the autoharp on "You Got the Silver" and percussion on "Midnight Rambler". His replacement, Mick Taylor, plays guitar on two tracks, "Country Honk" and "Live With Me". Keith Richards, who had already shared vocal duties with Mick Jagger on "Connection", "Something Happened to Me Yesterday", and "Salt of the Earth", sang his first solo lead vocal on a Rolling Stones recording with "You Got the Silver". The album has been called a great summing up of the dark underbelly of the 1960s. 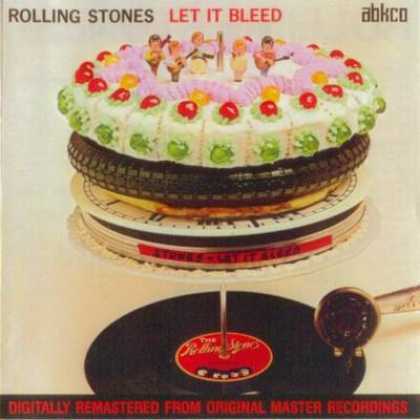 Let It Bleed is the second of the Stones' run of four studio LPs that are generally regarded as among their greatest achievements artistically, equalled only by the best of their great 45s from that decade. The other three albums are Beggars Banquet (1968), Sticky Fingers (1971), and Exile on Main Street (1972). The album is often thought to be a response to Let It Be by The Beatles; though the Beatles would not release either the song or the album of that name until 1970, the major recording sessions had taken place in January 1969, prior to the majority of the Let It Bleed sessions, and it was generally known that the project existed. Theories vary as to whether the title was making fun of the Beatles' misplaced optimism and inability to complete their own album, or was an expression of solidarity with a recording process that had been just as taxing as the Stones'. Released in December, Let It Bleed reached #1 in the UK (temporarily knocking The Beatles' Abbey Road out of the top slot) and number 3 on the Billboard Top Pop Albums chart in the US, where it eventually went double platinum. The album was also critically well-received. In 1998 Q magazine readers voted Let It Bleed the 69th greatest album of all time, while in 2000 the same magazine placed it at number 28 in its list of the 100 Greatest British Albums Ever. In 2001, the TV network VH1 placed Let It Bleed at number 24 on their best album survey. In 2003, it was listed as number 32 on the List of Rolling Stone's 500 Greatest Albums of All Time. In August 2002, it was reissued in a remastered CD and SACD digipak by ABKCO Records.